South Korea's Army has grounded more than 90 Surion helicopters in service, an official said Wednesday, as safety concern has grown since the deadly crash of a Surion chopper a day earlier. 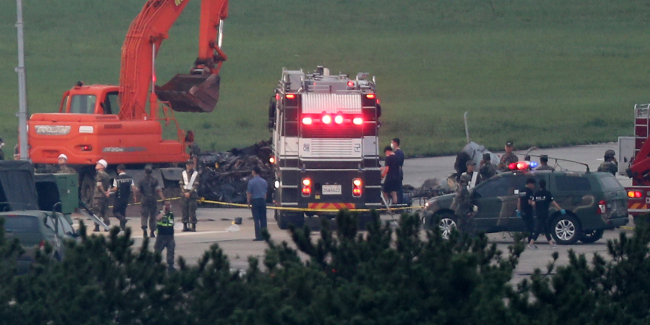 The MUH-1 Marineone, the Marine variant of the KUH-1 Surion helicopter, crashed at a military airport in the southeastern city of Pohang, killing five of the six marines aboard and injuring the other. The Marine Corps is investigating the cause of the incident. "We will review whether to resume the operation (of the choppers) after the results of the probe come out," the Army official said. The crash may also affect the Marine Corps' plan to introduce two dozen more Marineones by 2023, including two later this year. KAI's share price fell 9.34 percent to 34,450 won ($30.44). The helicopter was on a test flight in Pohang, some 370 kilometers southeast of Seoul, after repair work when it went down from a height of about 10 meters and caught fire, Marine Corps officials said. They also released CCTV footage of the accident, which shows its rotor blades being separated from the fuselage four to five seconds after takeoff. It was hovering around 30 meters above the ground. It suggests the possibility of a defect in the rotors-related parts or a maintenance problem. "We are leaving open all possibilities (including potential chopper defects)," a marine official told Yonhap News Agency, declining to be named. "Well, It may not be totally impossible (for the crash to affect the procurement plan) as we have to carry out the investigation to verify the causes ... It depends on the results of the probe," he added. The pilot of the chopper is known to be a veteran member with flight experience of some 3,300 hours, one reason why marines are not ruling out the possibility that the accident could be attributable to potential defects of the helicopter. Military authorities have launched a joint investigation team involving officials from the Marine Corps, Navy, Air Force, Defense Agency for Technology and Quality and the Army's aviation operations command. KAI said it would cooperate with the investigation if it is called on to join it, while expressing condolences for the five marines killed in the accident. "Our position at this point is to actively support (the investigation) if the military needs our technical support," a KAI official told Yonhap. "We are currently on standby and closely watching the situation, as we have yet to receive any call from the probe team." The Marines received the helicopters in January for transporting its service members and equipment. The MUH-1s are the first major aircraft in the possession of the 28,000-strong troops since they were integrated into the Navy in 1973.